It seems like any time mophie makes any changes to the juice pack air, they make a very big deal of it. 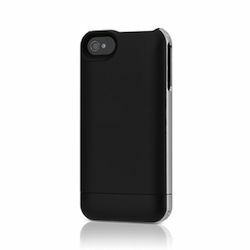 We have reported on the juice pack air before, and it is designed to give some extra juice to an iPhone device. They have now made it a snap. I have tried them out before, and it looks like the only change is that the snap has a removable bottom to make the phone easier to insert. You can see the seam on the removable snap in the picture. I’m not certain how many of these other features are new, but it has a Standby Switch that can toggle between charging and standby. Then there is the LED Status Indicator that indicates charging mode and current battery life. Oh, did I mention that it has a USB Charge and Sync for when you want to connect to iTunes without removing it from the juice pack? Like I said, I have no idea how many of these features are new to the snap, but here are the stats: it has additional talk time of 6 hours on 3G, up to 12 hours on 2G. It also has 36 hours of audio playback, and 9 hours of video playback. You should be able to get the mophie Juice Pack Air snap at the Apple Store for a price of $79.95.